There appears to be a new all-time leader in most money spent over a California ballot proposition – and it’s not Proposition 10, the measure that would allow local governments to impose rent control, which has led to a gigantic donnybrook pitting well-funded Democrats against deep-pocketed developers and property owners. But even more is being spent on Proposition 8, which would require dialysis clinics to pay rebates to health insurers as well as a penalty to the state if their revenue topped 115 percent of some but not all their costs of operation. The measure – sponsored by the Service Employees International Union-United Healthcare Workers – is depicted by the companies which run the clinics as an SEIU attempt to punish them for the union’s inability to unionize clinic workers. 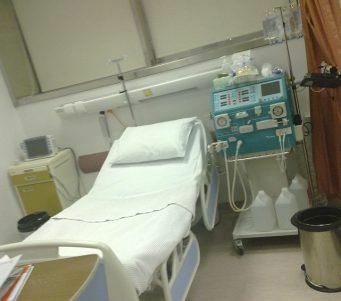 They point to the decision to omit certain operational costs from the revenue calculation as a cynical retribution – one that could force many of the state’s 550-plus licensed dialysis clinics to close or reduce hours, hugely inconveniencing the 70,000 state residents who need the machines to clean their blood of toxins because of problems with their kidneys. A group of clinic operators – led by DaVita and Fresenius Medical Care, the two biggest companies – have provided $110 million to beat the measure. TV ads showing dialysis patients warning their lives would be devastated if Proposition 8 passes have been a constant presence in large California media markets for more than a month. The SEIU, which has contributed $18.8 million to the Yes on 8 campaign, is being outspent by nearly 6-1 – so far at least. If internal polls show Proposition 8 close to passing, the dialysis companies could afford to spend that much a day until Nov. 6. That’s because they made about a $3 billion profit in California last year, according to an Associated Press report last week. “We will spend what is necessary to protect patients from this dangerous and irresponsible ballot measure,” No on 8 spokeswoman Kathy Fairbanks told the Associated Press. In a Los Angeles Times story, SEIU-UHW leader Dave Regan depicted Proposition 8 as an attempt to help dialysis patients deal with a “predatory” industry. “[They] have a terrible business model and they’re gouging patients and insurers,” he said. Fresenius and DaVita, which was ordered to pay $253.5 million in damages in a June court ruling after two patients’ deaths, have been accused of cutting corners to raise profits. But dialysis companies say the SEIU’s concerns about how their industry works were nowhere to be heard when the union was trying and failing to get clinic workers to sign up for SEIU representation in contract bargaining. The Times’ recent coverage notes that since 2012, the SEIU has taken at least initial steps toward 14 local and state ballot measures that targeted California health care industries which push back at attempts to unionize. For example, in 2016, the union pursued a measure to cap the pay of hospital executives. The $128 million-plus spent so far on Proposition 8 is the most on a state ballot measure since 2002; official California campaign spending records from before then are unavailable, according to the Times.